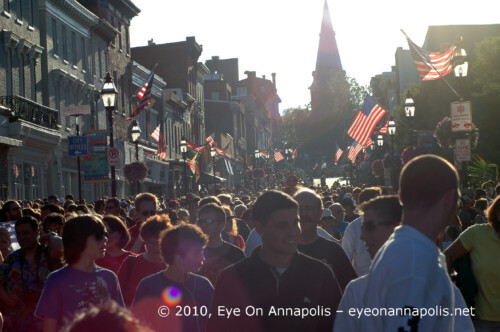 Yesterday, Annapolis celebrated yet another Independence Day. This year’s festivities seemed to be plagued with some serious timing issues. The parade got off to a good start and by 7:00pm it had arrived at our vantage point on Main & Conduit Streets. And by 7:30pm it was all done–or so we thought. Crowds leave after parade ended the first time. The photo above was taken at 7:24pm from below Conduit Street. There was no sign of any additional floats, emergency vehicles, or politicians all the way up to Church Circle. But about 45 minutes later as we were enjoying dinner at Mangia’s, the second round of parade passed by unnoticed. If anyone has any parade photos after 730pm, we would love to share them with our readers. Please send them to [email protected]. Please check back later today for a video! But, a parade is a parade, and when it is followed by fireworks (also with some scheduling issues–no one seemed to know when it was over) and good friends, we call it a good night! Happy Fourth of July! Note: Settings were off on the camera. Sorry! To see the rest of the photos, please CLICK HERE.